Unfortunately, I think I am an opportunist when it comes to photography. I go and see what I can find and come home. I seldom go in search of a specific image. That is too bad. But, I had been eyeing an opportunity for some time and had created just the perfect image in my mind. It was of the building just south of Tempe Lake between the Mill Avenue bridge and Rural Road. 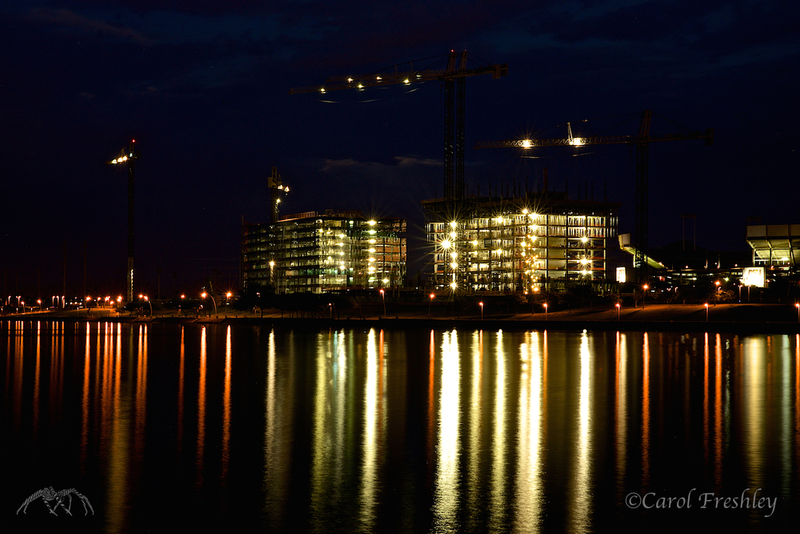 There were at least 5 cranes, partial buildings, and I thought it would make a great photo in a blue hour. And then . . . Super Moon!!!! So, off I took yesterday afternoon to scout a site for capturing the much talked about super moon with the site described above as part of the foreground. I had checked times, degrees of where it would rise, etc. I realized that the moon would rise just as the sun set. That could, maybe, be an advantage in leveling out the light. Blah, blah, blah. I found several options after hiking about for an hour without heavy gear. I even managed to park close by. Yeah! Things were looking pretty good. I was pumped! If you are interested, here are the shots I took. I put metadata and times under each shot. Great fun . . . just . . . the moon did not show up for my party! ISO 560, f/19, 1/60 with Nikon D800 and 24-70mm f/2.8 Tamron lens. Taken at 6:38 PM. Camera and lens will stay the same all evening. Also, a very good polarizer was on my lens the whole time. ISO 100, 70mm, f/8, 1/8 at 7:07 PM. My expectation is that the moon will rise between the most left crane and the middle building under construction. Aside from being quite bright with the sun still not having set, I am thinking the clouds to the East just might be a problem! Check weather app. Yep, clouds are going to be a problem. Dang it! ISO 100, 34mm, f/8, 1/3 at 7:15 PM. No moon. I comfort myself in realizing that I had wanted to be here for a long time for a blue hour shot. No whining allowed. Plus, just look at those pastels! ISO 100, 44mm, f/8, 1/6 at 7:22 PM. They say that sometimes the best photo is behind you. I check that out, just in case. Not bad. ISO 100, 66mm, f/8, 1 second at 7:26 PM. The lights are slowly coming on and I am now committed to stay for the full blue hour. A couple of other photographers show up looking to capture reflections. They are not interested in the Super Moon. They point out that there is lightning in the distance (way to the left of this image). I check my app and see that it is 39.5 miles away. You can relax mom. ISO 100, 46mm, f/8, 1 EV, 6 seconds at 7:33 PM. More lights are coming on. How can one get starbursts with an f/8? ISO 100, 46mm, f/8, 4 seconds at 7:34 PM. Still getting starbursts! Very cool. ISO 400, 70mm, f/22, 30 seconds at 7:48 PM. I am now into serious blue hour and the settings show that. The choice to use f/22 was intentional (I shot other combinations). I like the way this one looked out of all of them shot. Unfortunately, some components are still blown out. I am still thinking about how I might adjust, in camera, to avoid that. By now I had made new friends on Tempe Lake! We compared notes, watched lightning in the east and exchanged information. As we chatted, briefly, the sky changed! The sun wow long gone. So, where was this read coming from? ISO 400, 32mm, f/4, 4 seconds, at 7:52 PM. By the last image I was beginning to think about the rather long hike back to my car. I was thirsty. But, mainly I ease excited to get home and check my images! I will also admit to being pleased, even without the moon, to having gotten the shot I had thought about for several months. Now I am on to the next planned image.